Between the 101st Annual NCTE Convention in Chicago and Thanksgiving, we are truly filled up with delicious conversations and calories. We hope your holiday was just as satisfying. This week’s blog will share with you a few convention highlights and some thoughts about how they might lead to some new chart making ideas. Exploring Language and Wordplay in Picture Books was a workshop presented by authors Amy Krouse Rosenthal and Tom Lichtenheld. You might remember Amy as the author of Little Pea, Little Hoot, Little Pig, and Spoon. Tom is the author of What Are You So Grumpy About? and E-mergency. But together they have written several books: Duck! Rabbit!, The OK Book, and soon to be released, Wumbers. They shared with the audience how they see and hear letters and words as messengers of multiple meanings. For example, most people look at the letters, ‘OK’ and think, okay, that’s just a shortcut version of the affirmative or mediocre. 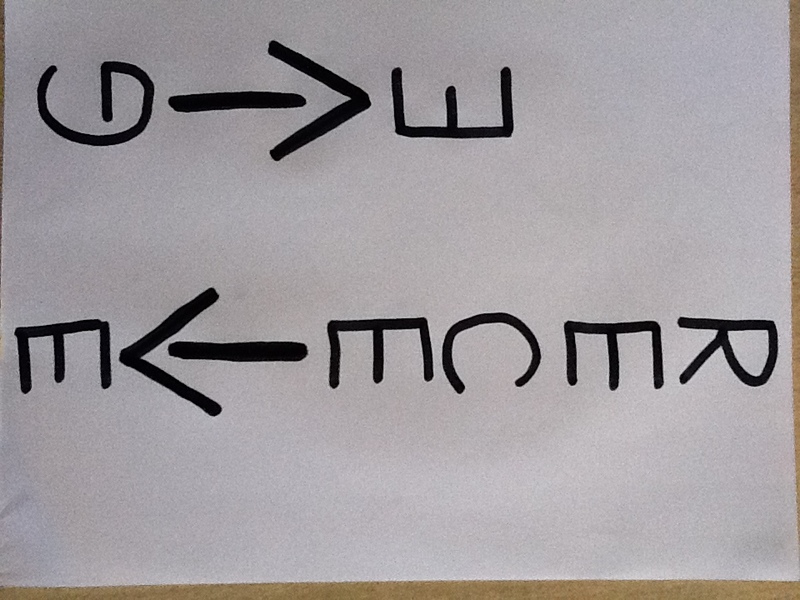 Amy, however, saw something very different when she turned these familiar letters a mere 90 degrees to the right. 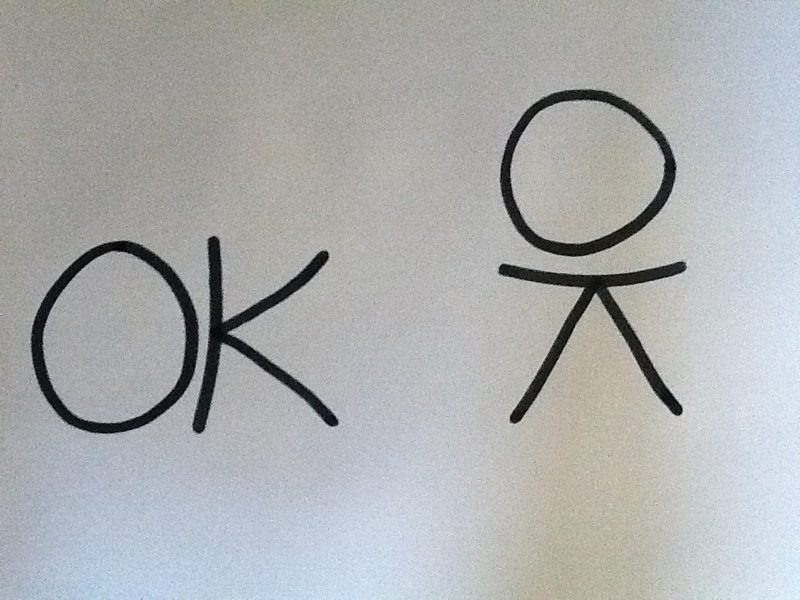 Suddenly the O became a head, and the K became two arms and two legs, inspiring The OK Book, which sends the message it is better to try things and be just okay, than never to try at all. The bigger message for teachers might be to try and look at what we see day after day in new and surprising ways by simply turning something a few degrees to the left or right. 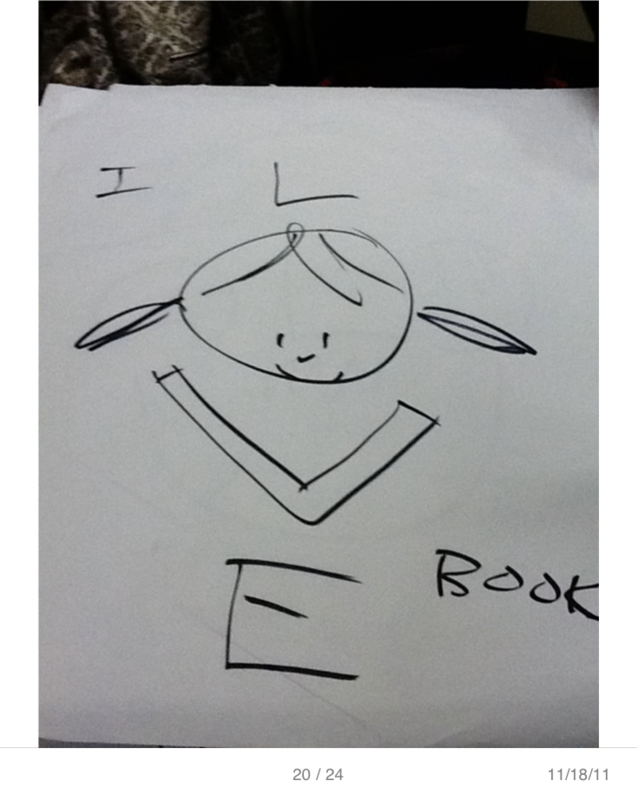 Turning letters into a person (The OK Book by Amy Rosenthal Krouse and Tom Lichtenheld. Amy and Tom shared a couple more examples of how they make things out of words. Take the word OLD for example. Tom quickly turned that into a picture of an old man. Two arrows going in opposite directions was suddenly turned into the message, The more you give, the more you receive. The word “Love” becomes a little girl reading a book. In their upcoming book, Wumbers (July 2012), they find fanciful ways to combine numbers and words (a nod to William Steig’s CDB). “It is s2pendous.” “They are pre10ding.” “Would you like some honey 2 swee10 you tea?” “Yes, that would be 1derful.” Can’t you see making use of some of these graphic elements in your charts? 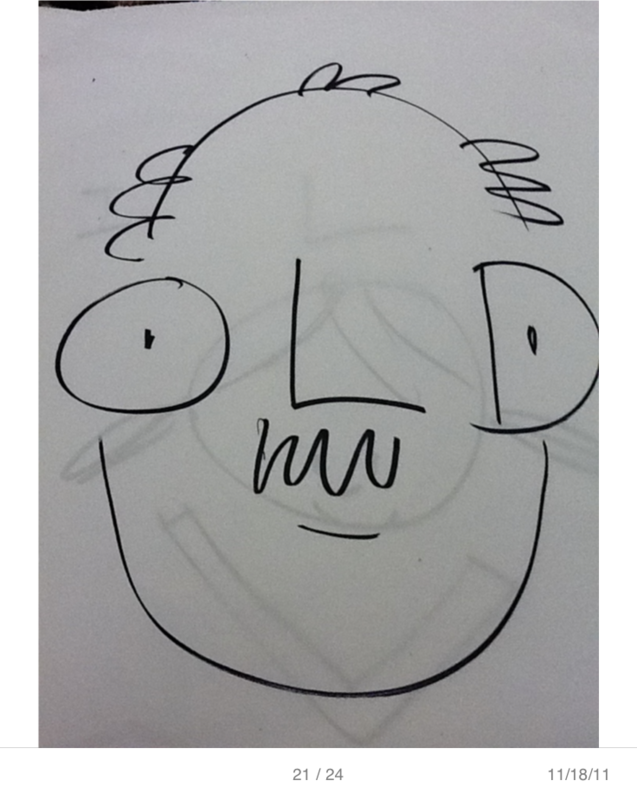 Tom turned the word "OLD" into a picture of an old man. Symbols can be turned into words with meaning: "The more you give, the more you receive." The word "LOVE" is transformed into a picture of a girl reading a book. Just like Amy Krouse Rosenthal and Tom Lichtenheld explore language and wordplay in their picture books, teachers can also explore language and wordplay when making charts in order to make teaching engaging, memorable, and clear. Bringing in some playfulness and creating charts that are interactive can go a long way in making our charts worthwhile and useful. Amy ended the workshop by saying, “Simple is the hardest thing to do, but you know when it is right.” The same goes for charts. Another children’s book author presenting in Chicago was Seymour Simon, an author known to teachers around the world for his exquisite nonfiction science books (He refers to them as photo essays). The workshop, Learning From A Master: Elevating Nonfiction Writing Through High Expectations for Craft, was chaired by Ellin Keene and also included professional authors, Linda Hoyt and Ann Marie Corgill who demonstrated how to use Seymour Simon as a mentor author for young writers of nonfiction books. Use photographs, illustrations and diagrams to clarify. Use comparisons to make the incomprehensible something a child can grasp. Use lots of teacher modeling to show how something is done. Put exemplars up on charts to be used as models. Make teaching clear by stating why it is important, demonstrate how to write this way, and show what it looks like once it is written. Slow down and make it simple. An example of one of Seymour Simon's 250 science picture books. These are just to name a few craft moves children can learn by studying such a master writer. 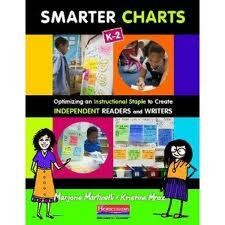 Of course, the charts you make will include photos, illustrations, book covers, and children examples. We can’t wait to see the types of charts you create! We hope this fills you up for a bit. And of course you can always find some tasty leftovers in our earlier posts. excited, as always, to ‘tune in’ on sunday night. i looove seymour simon’s nonfiction books, and can’t wait to incorporate some of his titles into our nonfiction work. thanks for the tips!! I love your blog! Thank you for such rich information! I have a question regarding Writing Workshop. When teaching units of study, often the unit is genre specific. What is your feeling about student choice? Should students write in the genre being studied or should they have complete choice on genre and topic? Any insights into this topic would be very helpful for my colleagues and I. We tend to believe that when you are teaching in a genre, it is helpful for all children to be writing within that genre so that they can try the great things you are teaching. There, of course, should also be times of complete choice- this might happen during independent writing projects or between units. Thanks so much for your insight, this will help my colleagues and I as we discuss this topic this week!